First broke by Iguana Sell, a luxury pen retailer located in Spain, we now have news of yet another, long rumored, new model release from Pelikan. This is the third new model for 2015 and I understand that this most recent one has been on the wish list of many enthusiasts. 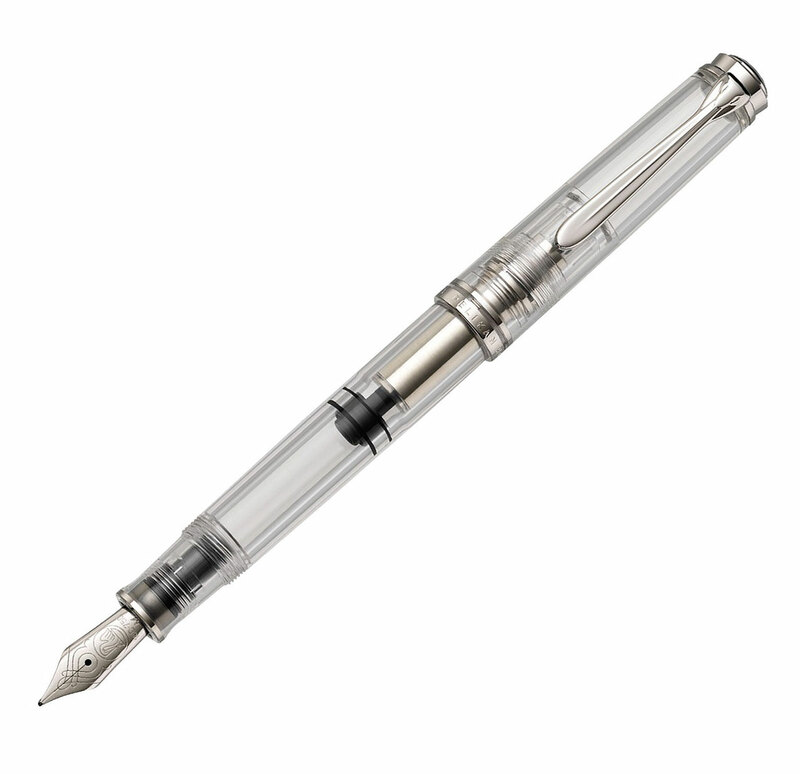 With a target release date of late April, Pelikan is going to bring us the M805 Clear Demonstrator. Similar in styling to the M1005 released in 2011, this release will feature a clear demonstrator with an all rhodium trim, including an 18C rhodinated nib. Many have long appreciated the M1005’s styling which won it the renowned French Le Trophée du Stylographe award following its release. While the M1005 is held in high regard, its size and price point does not suit everyone. The new M805 will help remedy that to some extent and it will reportedly come in two variants. The first will be a standard, clear demonstrator available in nib sizes F, M, and B. The second variant will have engravings in English on the barrel identifying the various components of the mechanism similar to the prior M800 clear demonstrator special edition. The second variant will be available in F and M nib sizes. The packaging looks like it will be similar to the M1005 and includes a gift box with a transparent window allowing for immediate visualization of the pen and its transparency. The first demonstrators were originally designed to allow manufacturers to demonstrate the operation of the pen to potential buyers and came in the form of non-functional cutaway models. These eventually morphed into pens made of transparent celluloid barrels to achieve the same effect but in a fully functional pen. Again, initially intended as pieces for salesmen, they quickly caught on with consumers and now are seen in many sizes and colors across manufacturers. While many will contend that only clear models are “true” demonstrators, the term generally applies to any pen with a translucent barrel allowing for an observable filling mechanism and ink reservoir. Given the visible nature of the contents of these pens, people with a penchant for neatness are often not well suited to demonstrator models as all of the flaws and potential stains are visible. Consequently, the appeal of a demonstrator itself is polarizing. People love them or hate them without much indifference in-between. 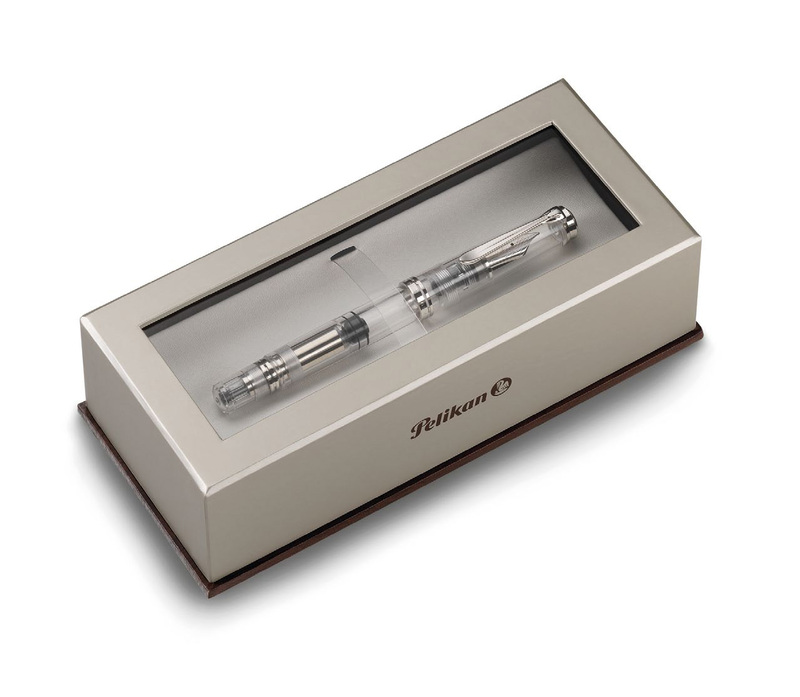 Pelikan acknowledges on their website that the production of a demonstrator fountain pen provides many challenges. Given the translucent nature of the barrel, they have to maintain unusually high standards with extra attention paid to the polishing of all of the components of the piston. Also, the brass piston housing does not usually facilitate visualization of the internal mechanism so a special window was placed to accomplish this. Personally, I like the looks of this new M805 tremendously, especially the engraved variant, and am really becoming a sucker for xx5 releases with the rhodium trim. That said, there are a few too many big releases competing for my wallet’s attention this year and so I don’t think that I will be quick to pick this one up. Between the clear demonstrator and the Stresemann, I think that I will favor the Stresemann. The M805 remains a nicely sized pen and pleasingly weighted but still misses the sweet spot for many. I’m also curious about the options for nib sizes or actual lack thereof. I’m sure that we’ll learn more about that as further details come to light and an official announcement is made. Finally, pricing is not clear to me but I do expect there to be a slight price differential between the two variations with the engraved model going for a slightly higher price. While official retail numbers aren’t yet available, I would expect to see these for sale between $550-600 but that is just an estimate based on past releases. I don’t think that we have heard the last about new releases from Pelikan for 2015 and will continue to look forward to what the fall may bring. What do you think about this new addition to the Pelikan family? You are giving great service to Pelikan collectors like myself but more importantly to Pelikan Co.(Chartpak). I hope they are giving you a handsome salary because you deserve it. Qustion: where do you get all this detail up to date information & photos from? Thanks for the kinds words Francis. No salary I’m afraid nor any shiny new pens from Hannover for me. Much of my information doesn’t even come from Pelikan directly. I just scour the web for information and synthesize it here for others to use. I guess I just know where to look and sometimes I get lucky. My whole goal for this site is to help others more easily navigate the confusion that can surround a brand that has produced so many models of pens over the years. The last newsletter was in November but I do think they have another one planned to come out soon so keep an eye out. What will the price be of this new demonstrator model? Pelikan’s official MSRP for the non-engraved model is 530 euros or $585 by today’s exchange rate. I believe the engraved version is quoted at $25-30 more. From what I’m seeing on early pre-orders, prices are going to run in the range of maybe $450-575 depending on the vendor. I think the non-engraved model will be more readily found for sale. Thanks for the info, and for a well thought out site with much great information. Look forward to future posts and to the clear demonstrator’s landing in the U.S.
I’ve enjoyed your Pelikan’s Perch so much, I put it on my favorites row! Thank you. Glad that you like what I do. I try to keep it interesting and informative and love the interaction with the community. Feel free to drop a line should you have any questions in the future.